As a homeowner, it can feel overwhelming with all of the things you need to keep track of. Between bills and general upkeep, it can be difficult to know when you need to make a change to your house for the better. 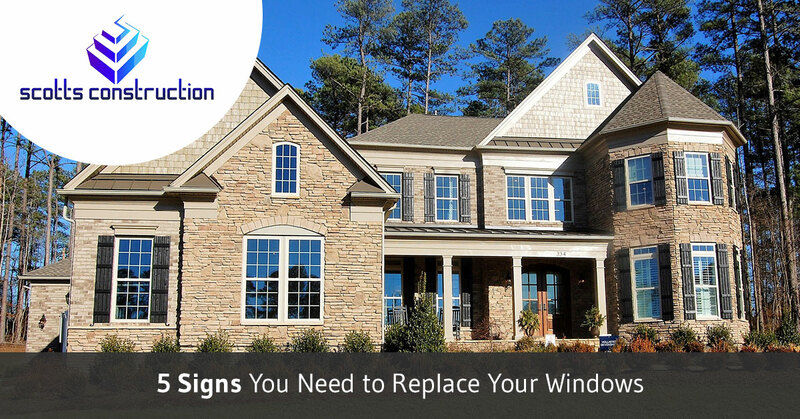 Today, we’re going to look at five signs that you need to replace your windows to help you know when the time is right. Bad windows can cause many problems, such as high energy bills and an increased risk of illness. Call Scotts Construction today to learn about our window replacement services. When your windows are closed, they should provide some level of soundproofing from outside noise. If you can hear cars passing by as if your windows were wide open, it’s a sign that they are not sealed correctly, or they were made poorly in the first place. With new double or triple pane glass windows, they are insulated with Argon or Krypton gas, which help to block outside noise. This is especially helpful if your neighborhood is often busy or you live near a busy road. If you walk up to your window, do you feel a breeze coming through, even though it is closed? If you do, it could mean a number of problems, including poor insulation, busted or faulty seals, and more. A drafty or leaky window will create an internal temperature issue, causing your HVAC system to work harder to maintain the temperature you desire. Not only does that cost you more on your energy bills each month, the additional wear and tear on your HVAC system will shorten its lifespan, leading to an expensive replacement down the road. This is a problem that happens most often in older homes with wooden or metal window frames. If they become soft, chipped, or rusted from water damage, they are damaged beyond repair. Not only does this indicate rot has set in for wooden frames, water infiltrating the window leads to mold growth, which is a health hazard to your whole family. This can also lead to your windows sagging if they haven’t already. Windows that have been improperly installed will develop balance issues, making them difficult to open and close. If your window frames are rotted or rusted, it will be tougher to use them as well. Windows that don’t close properly will also have issues locking, which becomes a security and safety issue for your home. If you’ve noticed it’s harder to operate your windows, it’s a good idea to replace them because it’s often a sign of more issues you may not be aware of. Look closely at your windows. Do you see signs of moisture between the panes of glass? If so, that means that the window’s seal has broken, which leads to air leaks, mold growth, and an overall inefficient window. When a window’s seal fails, the insulating gas that makes the window energy efficient escapes. A cracked window will likewise create more spots where air can leak in and out of the window. Condensation is a sure sign that a window needs to be replaced. Why is it important to replace windows? With all this said, you might be wondering to yourself why replacing your windows should be a priority. Poorly functioning windows result in higher energy bills, illness-causing mold growth, and an increased workload on your HVAC system that reduces its lifespan. When you replace your windows with energy efficient ones, you help reduce your heating and cooling costs, which will save you money in the long run. New windows will also improve your home’s security, thanks to stronger glass and improved locking systems. If you recognize one or more of these signs in your own windows, it’s time to replace them with something better. Your windows may not seem important at first, but they affect much more about your household than you might think. At Scotts Construction, we’re proud to offer top-of-the-line Target Windows. If you’re in the Orland Park area and want to improve your home’s energy efficiency, call Scotts Construction today! You can get a free estimate when you contact us. We hope to hear from you soon!